This is a five week absolute beginner’s course designed to guide you step by step into the traditional method of ashtanga yoga. The focus will be on understanding the fundamental techniques and principles behind this method and on learning the beginning postures of the sequence, slowly and progressively, week by week. Suitable for everyone new to yoga and also for any students who would like to start from scratch to learn the ashtanga sequence properly. This course is also ideal for anyone interested in Mysore classes to get to grips with the basics before they start. The next intro to ashtanga course will start on Tuesday 19th February 7.30 -8.30pm Book Here. Ideal to follow on from the introductory course, continuing progressively through the ashtanga sequence, with detailed instruction and demonstrations when needed. The basics learnt in the introductory course will be repeated and practiced with new elements added on each week. The most progress will be made if you attend regularly, but drop in students are welcome to any single class, whether you are a new student wanting to try the classes out or whether you are simply unable to make every week. The intro workshop is a one-off workshop covering the fundamental postures and techniques of ashtanga as well as information on the background and history of this system of yoga. 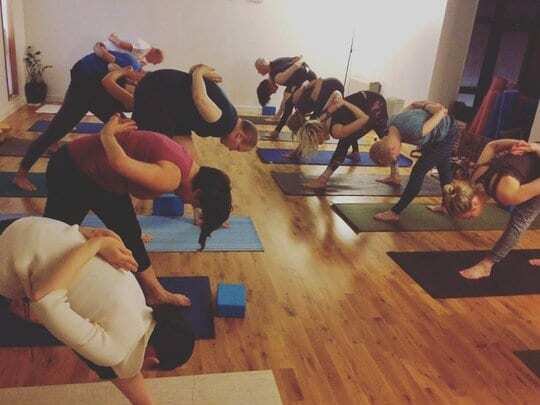 An ‘intro to mysore’ workshop is geared specifically towards starting morning self practice classes, but works equally well as a general introduction for anyone new to ashtanga. The next ‘intro to mysore’ workshop is on Saturday, 23rd February 15:00 – 17:30. Book here. You can join our beginners yoga waiting list to be kept up to date when new beginners classes will begin or email me if you have a question about starting yoga. Private lessons are available during the day throughout the week, and some Saturdays, for one-to-one tuition. Please contact directly to make a booking.